Chloe Goadby of Stirling University and St Andrews’ James Blyth proved too strong for the assembled fields at the 97th Scottish Student Championships at Moray Golf Club, Lossiemouth. Goadby began Day 2 two shots back of overnight leader Penny Brown, but came roaring through to the top of the leaderboard after a fine morning round of 67 (-4) on the New Course, aided by birdies at the/ 3rd, 6th, 12th, 13th and 14th . Meanwhile Lorna McClymont (SRUC) was building an impressive round of her own, resulting in a two under par score of 69, featuring birdies on the 7th, 9th and 14th. This was a fine effort on a difficult day, especially as it was the first sub-70 round of her career. Brown (Stirling) had an eventful morning, dropping three shots overall in a round that had only seven pars. She struggled to get back to her best in the afternoon, and cut a slightly embattled figure in posting a four over 79 (Old Course) despite three birdies on the way and thus had to settle for third place and a total of +11. Lorna couldn’t quite match the heights of the morning and dropped five shots to par in the front nine to lose any chance of 1st place. However she regrouped well and managed home with only one further dropped shot so as to secure a creditable second place at +10, one ahead of Brown. Goadby never looked in too much trouble in the afternoon, though she was perhaps less than content with a front nine of 40 (+3). However she turned for home with a steely sense of purpose, and compiled an error-free run for home that included birdies at fourteen and seventeen. 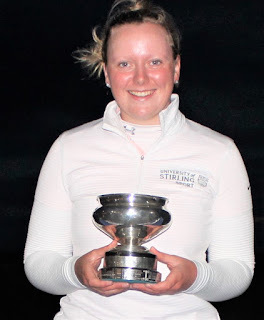 Her +2 total represented four very strong rounds in challenging conditions and Chloe can be proud to lift her maiden Scottish xtudents title and the Smith-Murray Cup. The Men’s Championship developed in absorbing fashion throughout 36 holes on Moray Old, on a day when par represented excellent golf. On a tough day for chasing, overnight leader James Blyth (St Andrews) set out knowing that avoiding mistakes was key. Two bogeys and two birdies heading out into the prevailing wind was just what the doctor ordered and having dropped shots at 13 and 16 he would have been pretty satisfied over lunch with a 73 (+2) for a total of +3 and a four stroke lead. Stirling duo Michael Lawrie and Robert Foley led the chasing pack on +7, with UHI’s Alistair McNaughton and Riccardo Cellerino a further two behind on +9. With darkening skies the afternoon round played out dramatically - and at times slowly – with the top five staying just about in touch throughout, albeit never quite close enough to really ramp up the pressure on Blyth. Cellerino played lots of good golf but would rue costly double-bogeys on the 2nd and 8th which left him with too much to do. A closing 75 gave him a total of +13 and fifth place. Robert Foley also had to respond to a front nine of 40, including a 7 on the par-5 2nd and although he rallied back in level par he would finish just outside the top three, on a total of +12. Team mate Michael Lawrie followed a very similar path, with the fiercely difficult Old Course front nine again showing its teeth. Despite a birdie three at the first hole he would struggle to the turn in 41 as a consequence of double bogeys at the fourth and seventh. Amidst the slide of the chasers only Alistair MacNaughton may have felt like he was heading in the right direction. Four threes helped him to the turn in 36 and he produced a gritty back nine of 37 to post a clubhouse total of 293 (+11). With the backdrop of faltering challenges, James Blyth’s primary task was to stick to his game plan and get round with the minimum of mistakes. Calamity called on the monstrously tough 2nd hole which yielded a triple-bogey 8 for the tournament leader. However, this perhaps galvanised things for Blyth as he covered the rest of the front nine in level par to turn in +3. The back nine, whilst a little scrappy, brought relatively little drama for Blyth and he did very well to par the final five holes under heavy skies and visible nerves to post a final round of 77 – probably the most welcome 77 of his career. 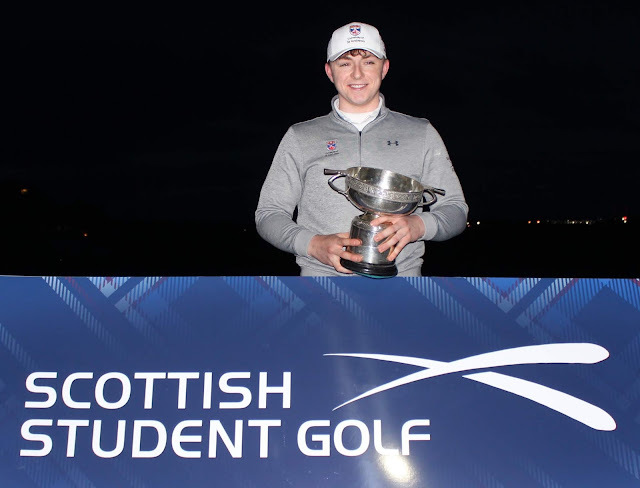 Blyth, therefore, deservedly claimed the Scottish students title and the Jack Allan Trophy. That concludes the stroke-play part of Championship week, and for a number of the top Scottish players, thoughts now turn to the BUCS Tour Finals at Lundin GC from 15-17 April. Meanwhile, at Lossiemouth the focus shifts to match-play, with the last 16 stage of the women’s individual championship, and the quarter-finals of the men’s team event commencing early Wednesday morning. Match updates will be available throughout the next three days via GolfBox for both the Men’s Team Tournament and the Women’s Individual Tournament.